If You’ve Got it, Flash it. If not, why not get it? Changes occur as we age. Teeth darken and develop little chips. Gums recede. Gaps appear. Before modern dentistry there wasn’t much anyone could do except to eventually get dentures. Luckily, nowadays there are alternatives and often you can get a dazzling with simple conservative procedures. No two faces or personalities are identical. And we’ll work with you to develop a custom plan that fits your goals and your comfort level! Simple Ways to a Dazzling Smile! Today’s porcelain veneers are ultra-thin and very light, and they cover a multitude of imperfections. We remove about a half millimeter of enamel and bond the veneer to the front of the tooth. For example, if your teeth are stained by coffee and cola, or if they just faded with age, veneers can brighten them up. If your active lifestyle resulted in chipped teeth, veneers can hide the damage. 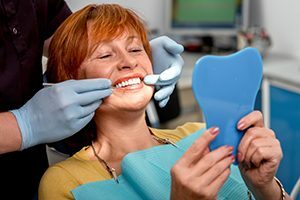 If permanent teeth just grew in wrong—misshapen or overlapping—veneers can contour or visually straighten them. At-home Whitening – Custom-fitted mouth trays are filled with a whitening solution and worn each day as directed for several weeks. Cosmetic Bonding – small chips, crack and imperfections can be fixed with composite, tooth-colored resin. Ask us for recommendations or about any of your concerns!